At the Back Institute, we perform the best non-traumatic procedures available using the most advanced tools and equipment. Some of our technology is only available here. 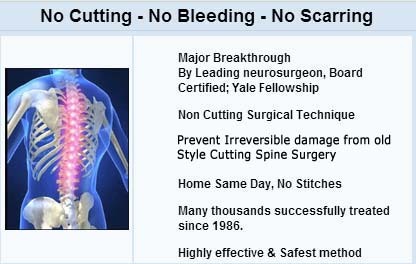 There is no cutting, bleeding or scarring. 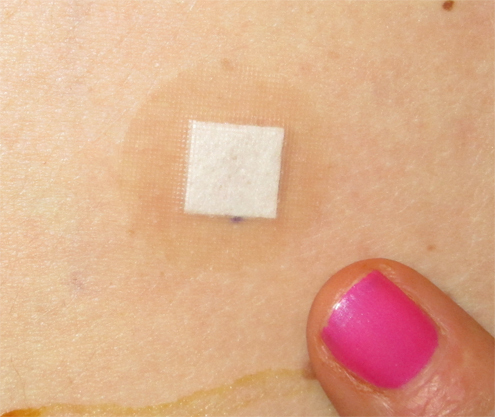 Patients are left with only a dot opening that is covered with a band aid. The fundamental approaches for non-traumatic access spinal disc removal were invented here. Since 1986, we have developed a lengthy resume of peer reviewed publications (more than 40 in the non-traumatic access field) and have taught our advanced techniques around the world. Our surgery center has the highest level of certification, the safest center for Non-Traumatic Surgery anywhere in the world. The advancements in proprietary equipment and non-traumatic techniques that the Back Institute has made over the last 20 years make us the leader in performing Non-Traumatic Spine Procedures. While many surgeons around the country, even in the biggest centers, claim to do minimally invasive spine surgery, the reality is that they are just beginning to learn how to do it. The problem is that the words "minimally invasive" are too vague and have lost their meaning. Although surgeons around the country are using smaller openings in their procedure, they are still cutting muscle and removing bone, causing scarring and altering normal anatomy as they access the problem disc area. Spine centers around the country rely on clever marketing and catchy words like "laser" to attract patients. 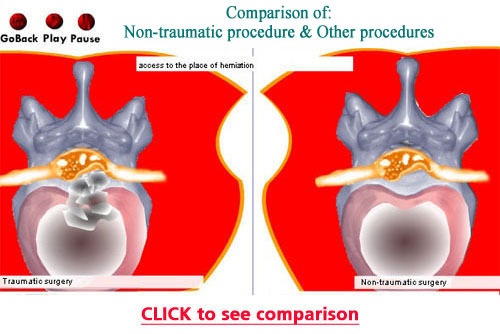 They lack the experience, expertise, credentials, and technology to do a truly optimal Non-Traumatic Procedure. In fact laser is rarely needed in any of these procedures, whether done at the Back Institute or elsewhere. The Back Institute is the only center in the world that can accomplish these truly optimal Non-Traumatic techniques, and that is why our procedure is a "Non-Traumatic Discectomy." During the past two and a half years, 25 patients with L5-S1 free fragments underwent outpatient endoscopic discectomies using a small, soft, malleable scope technique, which is not traumatic to the spinal canal contents. A skin puncture opening (less than 5 mm) is made; under local anesthesia with IV sedation, 1 cm off midline, for paramedian interlaminar access using a 4.2 mm outer cannula, with an inner telescoping fiber-optic working channel plastic endoscope, micro-dissectors and micro-graspers. The 25 patients ranged in age from 29 to 61, 15 males and 10 females. All had free fragments in the spinal canal at L5-S1 ruptured lateral to the dura. 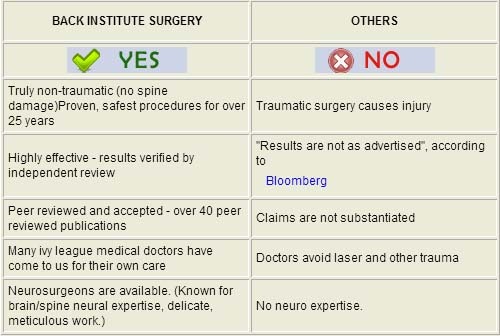 Open microdiscectomy had already been recommended in all cases. 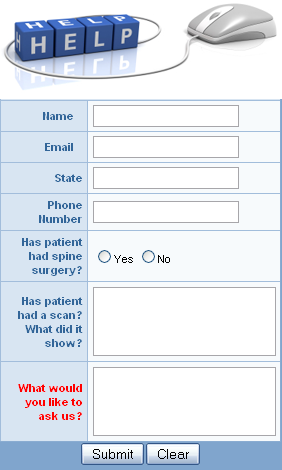 All had radicular pain, numbness and/or weakness for at least six weeks consistent with the herniation. Results (Macnab criteria): 22 excellent (no symptoms, no restriction of activity) 2 good (occasional symptoms), 1 poor (no improvement, required further surgery); for an overall success rate of 96%. The only adverse effect was that one patient developed a transient, mild, localized hyperpathia, which, however, rapidly resolved. This technique provides the advantage that the actual endoscope itself can be placed directly into the free fragment for optimal visualization and removal, in the most direct, least traumatic approach for reaching and removing free fragments at L5-S1. In this article written by Dr. Ditsworth: The overall success rate for the 75 lateral presenting or foraminal cases was 95%. The overall success rate of the 110 patients was 91% (excellent or good results are considered successful). Dot skin opening is so small, only a small bandaid is needed. All of this herniated disc material was removed through this tiny "dot" opening (4 mm) with the grasper shown. The photo was taken right after the procedure. It shows that the entire opening made in the body is very small. The problem has been treated without the trauma of any kind of larger surgery.